It's going to be rare that you see me hawk services for other people, though I'm not necessarily opposed to selling out (if the price is right). If I do you'll probably be able to tell by the giant ads on the side of the page. I want to assure you that I've recieved no money for the advice I'm about to offer. For an architect, contractor, or LEED consultant spending a decent amount of time tracking down sustainable materials and products, you MUST check out the GreenSpec directory and Environmental Building News. The former offers the most comprehensive directory of sustainable products and materials I've seen, and the latter offers the most concise, accurate, and most importantly independent, reviews of various sustainable products and industries. I suggest not subscribing to either independently but rather going ahead and chunking up the $199/year subscription fee for the whole deal. If I remember correctly there's a pretty substantial discount for AIA members, but I'm not sure what that is. Oh, and don't mess around with the paper versions, there are frequent updates online that you need access to. Honestly, if you're only working on about 1 LEED or sustainable project a year, you can probably get by with what you can find for free, but if you're working on multiple LEED projects at once this is the deal of the century. The suite also gets you access to a thorough database of sustainable projects (often including much sought after financial info), though this is really only an extended version of a freely available database run by the US Dept. of Energy. 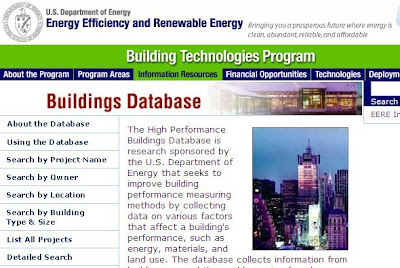 As of today, the free DOE site has 98 projects while the subscription BG database has 98 LEED and 206 total projects. The single greatest aspect of this directory is searchability (spell check says that's a word so I'm going with it). I can view products by LEED credit, and further cross reference them by CSI division. If I browse for "Urinals", I can find a list of ultra-low flow and waterless manufacturers, but the page will also be cross-referenced with articles about the industry in general (in this instance, a great piece on problems with waterless urinals and how to avoid them - the problems, not the urinals). If a contractor sends me some crap submittal about not being able to find low-VOC paint or bamboo flooring, this is where I'll go to prove them wrong. The time savings of finding three sources for a competitive bid in one place is a huge help on public projects as well. I use this site at least 2-3 times a week. I'm a researcher at an architectural firm, and that often means writing reports about various materials and systems. EBN frequently does my job for me, which is probably why I love it so much. The articles are very thorough and always include perspectives from engineers, architects, and the various manufacturers involved. They can be techinical (read: boring, likely as many of my posts), but are always clearly written and easy to understand. My thought is that if you need to know something, you're probably going to have to do some boring reading at some point... I'm on this site at least once a week. My only real complaint about the directory is that it stops short of providing hard data. The site will tell you that the carpet has recycled content, but not how much... you're left on your own to slog through the mfr's site for that. I can understand the reasons (these numbers are always changing), but it's still frustrating that there is not a single source for that kind of information. 4spec.com - Not good for stuff like recycled content, but this more typical construction materials directory has an option of searching by mfr zip code (and CSI designation of course) that works surprisingly well for determining regional content. 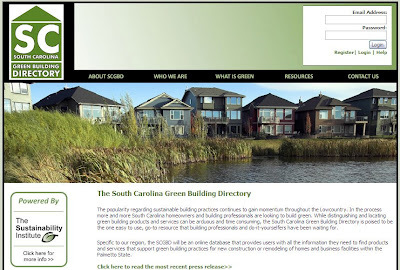 SC Green Building Directory - For those lucky enough to live in (or to a lesser extent, those within 500 miles of) South Carolina will soon have a locally focused green building product and services directory run via the SC Sustainability Institute. Right now they're accepting submissions of product and services and the actual directory is offline. I'll update on progress as it develops. Google - A little annoying to use, but at the end of the day it's free and will get the job done. Did I miss a good info source? Leave a comment below! A LEED AP who blogs about materials. Posts are labeled by LEED credit. Check it out!